This entry was posted on Thursday, September 29th, 2016 by Frances Ryan. I’m writing this post from Serenity Lodge*, my home for the next two weeks. 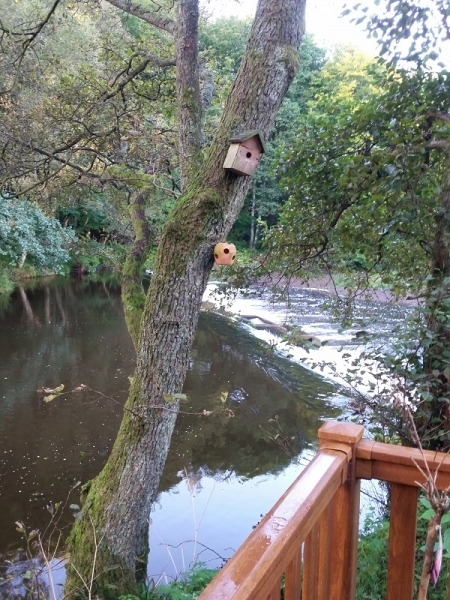 My view from the deck overlooks the River Devon as it flows through Clackmannanshire on the outskirts of Dollar. It is peaceful, despite the three Labradoodles and chatty parrot I’m sharing the space with, and I am sure the location will help me find a bit of my own serenity! This is the last (maybe not?) in a series of recent housesitting gigs that I’ve done over the past few months. It began with a two-week gig in Falkirk. The offer for housesitting was made by someone I know; not because they needed a house-sitter, but rather because I needed a wee break away from my regular routine so that I could get some work done. Anyhow, I was sharing my adventures in house- and pet-sitting on Facebook, which meant another friend thought of me when her friends’ normal house-sitter fell through. And that’s how I landed my current gig. During these two weeks, I will be getting my head down and working on data analysis for my PhD. I am also planning to catch up on my PhD and Just Frances blogging as well as a few other administrative tasks. There is also a bit of exercise equipment and a hot tub here, which I plan to use to help with my ankle recovery. So really, these two weeks will be good for me on so many levels! Of course, the occasional weak 3G signal means that I might get to share random thoughts on Facebook or Twitter every so often. But don’t hold your breath for that! But for now, it is time for me to head back to Serenity Lodge so that I can enjoy some serenity, now. Stay tuned later this week for photos from last week’s trip to Croatia! * Whilst I wrote the post from my peaceful perch at the lodge, I had to walk down the road to access WiFi in order to share it with you.